Posted on 28 October 2017. ST. JOHN’S, Antigua, Oct 27, CMC – Prime Minister Gaston Browne has described the investigation involving his former tourism and investment minister Asot Michael as “a serious matter” insisting that Michael “was actually arrested on a serious issue” in the United Kingdom earlier this week. Browne, speaking on Observer radio here, said that after he was briefed orally on the situation regarding the arrest, he immediately requested that law enforcement authorities in Britain submit the information in writing to Antigua and Barbuda’s High Commissioner to London, Karen Mae-Hill. “And, I also understand that it included the local police as well. And, as a result of certain information they would have gathered, that is what led to this action,” Browne told radio listeners. Earlier this week, Michael in a statement, said he was “sorry” that Prime Minister Browne had not contacted him prior to making public his removal from the Cabinet. “I propose to speak to him as soon as possible, and to explain the situation,” Michael said, adding that he had also been informed that a local radio broadcast had indicated “that the police in England informed me that I would be required for further questioning. “This is untrue. The police did not say this to me,” he added. Prime Minister Browne said he is still awaiting a document from the British authorities explaining why the National Crime Agency (NCA) took Michael into custody. “I am aware. I and the one who requested the high commissioner to get what they told her verbally in writing. This was done after I received information and took the necessary action to relieve Minister Michael, or former minister for that matter, Michael of his ministerial position. Prime Minister Browne said he has since assumed the tourism, investment, economic development and energy portfolios. Earlier this week, the minority opposition Democratic National Alliance (DNA) questioned the: haste” in which Prime Minister Browne removed Michael from his cabinet. In a statement, the DNA said that while like the rest of the country it will “follow this unprecedented development with keen interest”, it has taken note of the “rapid” move by the prime minister to revoke the appointment. “It is a well-established legal principle that every accused is innocent until proven guilty. 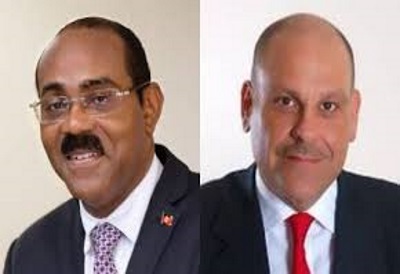 However the DNA finds it more than curious that Prime Minister Browne acted with rapid fire in revoking Minister Michael’s appointment as a Cabinet Minister and relieving him of all portfolio responsibilities,” the DNA said in the statement.